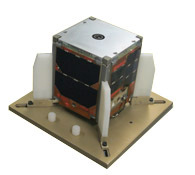 After successful launch of ICUBE-1 in November 2013, IST is now developing a 3U CubeSat named ICUBE-2. Pakistan’s first Cubesat satellite, iCUBE-1, was launched on November 21, 2013, onboard Dnepr launch vehicle from Yasny launch base, Russia. IST has etched its name among the foremost universities in the World and the only University in Pakistan who have built and launched a Cubesat satellite.